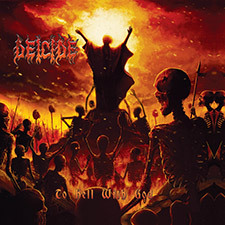 To Hell With God was initially released in 2011. The album received rave reviews from metal media and marked one of DEICIDE’s most well received albums in their three-decade career. The original vinyl version of To Hell With God quickly sold out. Think Fast is now offering a revamped pressing on fire splatter vinyl, complete with a gatefold jacket. Limited to 1,000 copies and under exclusive license from Century Media.